Beach lovers and watersport enthusiasts flock to Isla Mujeres. Discover some of the best dining, diving and wildlife encounters in the Mexican Caribbean on this island. 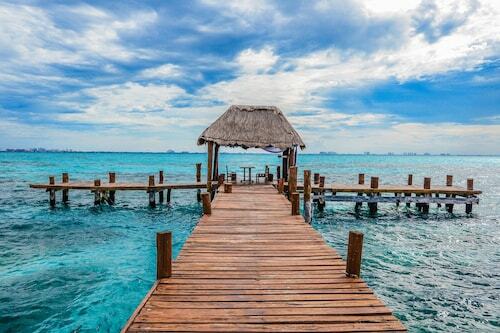 A short boat ride from Cancún, the laidback vibe of Isla Mujeres is far removed from the bustle of the mainland resort. Experience the island charm, which blends the natural beauty of the Caribbean with Latin beats and ancient Mayan culture. From the ferry terminal you are just steps from Centro, the island’s downtown district home to bars, restaurants, hotels, souvenir shops and supermarkets. Admire the colorful ocean-themed Sea Wall Murals. Spot statues such as the La Trigueña sculpture of a naked woman and Statue Ixchel, dedicated to the Mayan goddess of fertility. 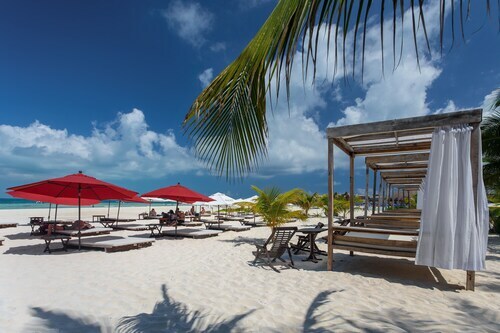 White crushed-coral sand and transparent turquoise waters characterize the island beaches. Spot fish and turtles while swimming and snorkeling, windsurf along the coastline, read beneath the shade of a palm tree and experience the festive atmosphere at beach bars. Norte Beach and Playa Sol are within walking distance of Centro. Rent a bike or golf cart and visit Lancheros Beach, Paraiso Beach and Playa Indios. Get up close with playful dolphins, manatees and sea lions at Dolphin Discovery Isla Mujeres. Tortugranja is an aquarium with exhibits related to the conservation of sea turtles. Try zip lining, join a snorkeling excursion and relax in an infinity pool at Garrafon Natural Reef Park. Spend a day kayaking, paddleboarding, riding waterslides and snorkeling at Parque de los Sueños. The island has cultural activities too. Learn about maritime history at Capitán Dulché Museum, a small museum set inside a chic beach club. The Hacienda Mundaca is the remains of a mansion built by a 19th-century pirate to woo a local woman. See huge tree sculptures and a ruined Maya temple while wandering the trails of Punta Sur coastal park. With consistently warm temperatures Isla Mujeres is a destination you can visit at any time of the year. The 15-minute ferry crossing from Cancún makes it a popular daytrip destination. 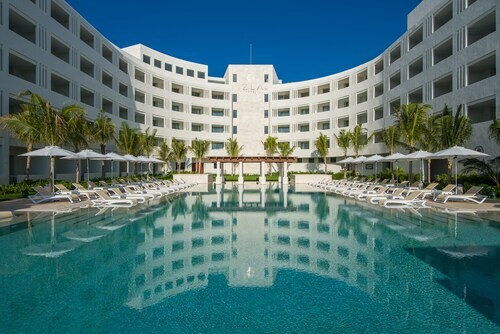 Round out your days at all-inclusive resorts and beachside villas. 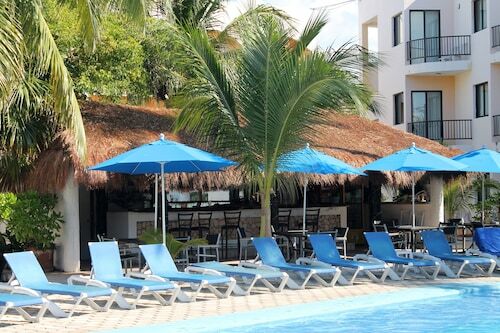 Nestled on the beach, this Isla Mujeres hotel is just steps from Shark Beach and Garrafon Natural Reef Park. Dolphin Discovery is 0.9 mi (1.4 km) away. 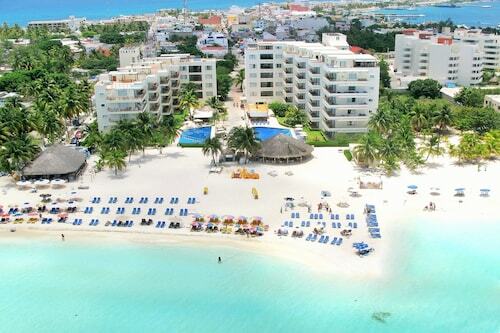 Nestled on the beach, this Isla Mujeres resort is within 3 mi (5 km) of Norte Beach and Crayola House. Mundaca House and Tortugranja Turtle Farm are also within 6 mi (10 km). Nestled on the beach, this Isla Mujeres hotel is within a 10-minute walk of Terminal Marítima Isla Mujeres and Garrafon Natural Reef Park. Norte Beach is 0.7 mi (1.1 km) away. Located in the heart of Isla Mujeres, this hotel is within a 10-minute walk of Terminal Marítima Isla Mujeres and Garrafon Natural Reef Park. Norte Beach is 0.6 mi (0.9 km) away. 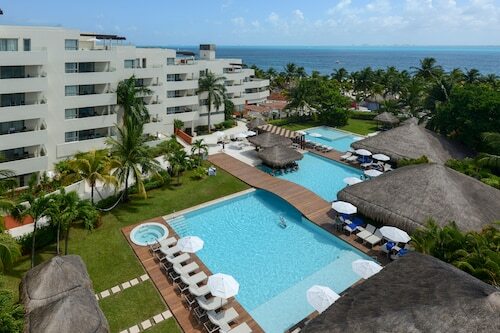 Nestled on the beach, this Isla Mujeres hotel is just steps from Aztlán Galería and Norte Beach. Garrafon Natural Reef Park is 1.5 mi (2.4 km) away. 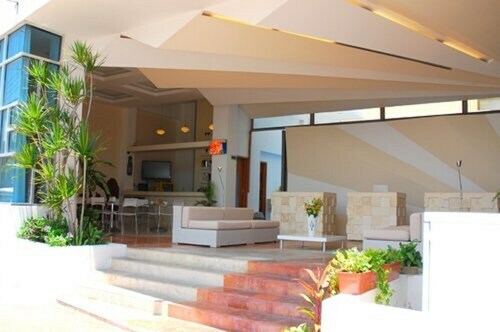 Located in Isla Mujeres, this beachfront hotel is in the city center, just steps from Cocal Beach and Norte Beach. Garrafon Natural Reef Park is 1.3 mi (2.1 km) away. Nestled on the beach, this Isla Mujeres resort is within a 5-minute walk of Parque de los Suenos and Garrafon Natural Reef Park. Dolphin Discovery is 2.1 mi (3.4 km) away. Thu., 7 Nov. - Sat., 9 Nov.